Heat oven to 350°F. Line 15x10x1-inch pan with foil; spray 13x9-inch (3-quart) glass baking dish with cooking spray. 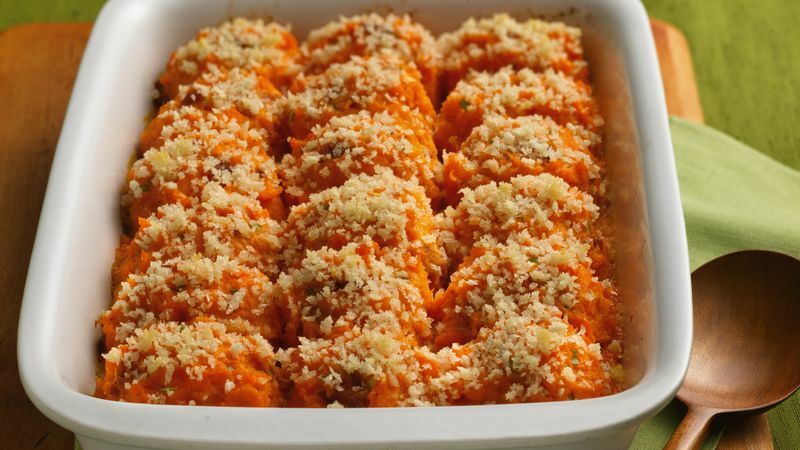 Pierce sweet potatoes several times with fork. Place in pan. Bake about 1 hour 15 minutes or until tender. Cool 10 minutes. When potatoes are cool enough to handle, peel potatoes and cut out any eyes or dark spots. Meanwhile, cook bacon as desired until crisp; chop. In small bowl, mix bread crumbs and 1 tablespoon butter; set aside. In large bowl, mash potatoes with potato masher. Stir in chopped bacon, sour cream, 1/4 cup butter, the onions, salt and pepper until well blended. Spread mixture in baking dish, or form individual servings in dish with 1/2-cup ice cream scoop or measuring cup. Sprinkle crumb mixture evenly over top. Bake 20 to 30 minutes or until thoroughly heated and bread crumbs just begin to brown. Save prep time by using pre-cooked bacon. This casserole can be made the day before. Simply cover it and refrigerate until you're ready to bake.